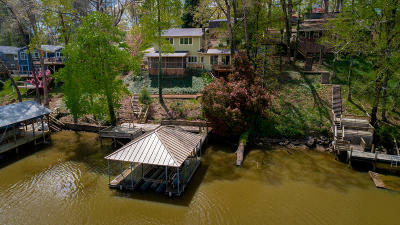 Lake Front Living!! Welcome to 7425 Savannah Drive. This 3 bedroom, 2 bath home with a detached 2 bedroom, 1 bath guest house would be the perfect primary residence or weekend getaway. You can go boating or fishing anytime with the private boat dock with lift. Both of the homes has amazing views of the lake and the main house was built to take advantage of the views with lots of windows. 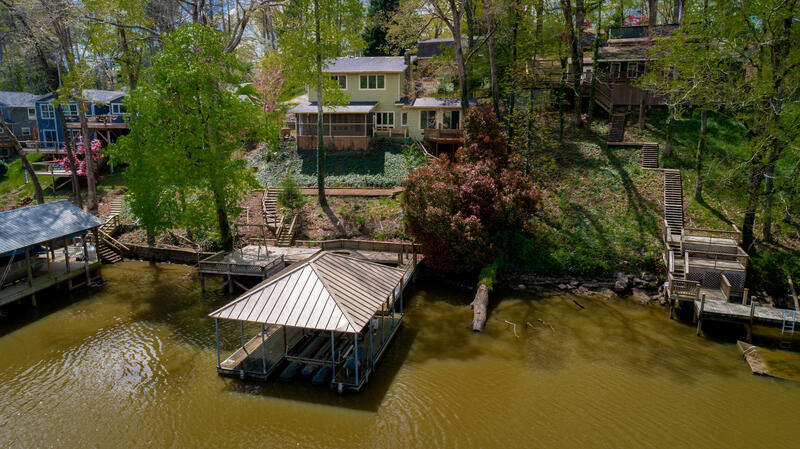 Step inside to the vaulted foyer that leads to 2 good sized bedrooms both with large windows overlooking the lake and a full bath with double sinks and granite counter top. Step into the large open great room with beautiful mountain stone fireplace, tile floor and wet bar which is the perfect entertaining space and is open to the kitchen. The cook's dream kitchen features granite counter tops, stainless appliances plenty of cabinet space. This space also has floor to ceiling windows for you to enjoy the lake view. Step through the French doors to the large screened in porch. There is a 3rd bedroom with a private deck and full bath that completes this level. The detached guest house has a 1 car garage. The living room and laundry room is on the 1st level. Step upstairs to the kitchen, 2 bedrooms and full bath. This would make the perfect in-law suite. There is plenty of great outdoor living space to relax and enjoy the view. There is a stationary dock with covered boat slip that has a air lift and power. This home has been well maintained and is ready for new owners, make your appointment for your private showing today. Purchase with confidence as this home comes with a 1 YEAR HOME WARRANTY! SPECIAL FINANCING AVAILABLE ON THIS HOME COULD SAVE YOU APPROXIMATELY $5700 WITH THE ZERO PLUS LOAN, CONTACT AGENT FOR DETAILS. 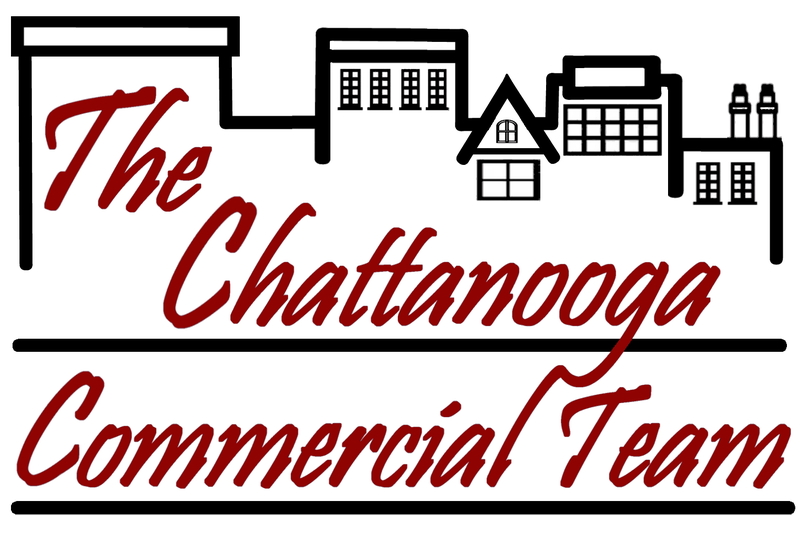 Check Out this site for all your Chattanooga commercial property needs! The Chattanooga Commercial Team of Heather Bevil and Valerie Gallups bring true commercial real estate experience to bear when representing Buyers, Sellers, Landlords, and Tenants. Just click the logo to explore! © 2019 Chattanooga Association of Realtors. All rights reserved. Information deemed to be reliable but not guaranteed. The data relating to real estate for sale on this website comes from the Chattanooga Association of Realtors and the Broker Reciprocity Program.sm. Real estate listings held by brokerage firms other than The Chattanooga Home Team are marked with the BR logo and detailed information about them includes the name of the listing brokers. Listing broker has attempted to offer accurate data, but buyers are advised to confirm all items. Information last updated on 2019-04-25.